The vintage Arrow Giant Dipper car travels to Playland! In 1984 the Santa Cruz Beach Boardwalk announced that it was planning to replace the roller coaster cars on its world famous Giant Dipper, the historic wooden coaster built by Arthur Looff. ACE members Nancy Redden and Mike Chew immediately rented a truck and headed down the coast to try to get one of the cars. The old Arrow cars of the historic red and blue trains (the original colors: they’d been painted green and yellow by 1984) were going to be upgraded with new Morgan trains. For $200, Mike and Nancy bought a middle car of the old red train. Weighing about 800lbs, the coaster car strained the forklift and barely made it into the truck. Nancy Redden and Mike Chew brought the Giant Dipper car to Oakland, CA, where they have stored it for the last twenty-five years. “We had a great time with it in the front yard!” Redden says. “My family, my neighbors…even my pets have been in it and had their pictures taken.” The enormous double car sat on the street, protected by tarps. For over two decades Redden and Chew periodically washed and waxed it. The Giant Dipper car survived numerous El Niños and even a run-in with an East Bay Municipal District truck, which backed into it, causing some minor damage. The car traveled the Giant Dipper track from 1955 to 1984, and still sports the original foot brake. “I used to put people in it and pull the bar down for kicks!” Redden laughs. 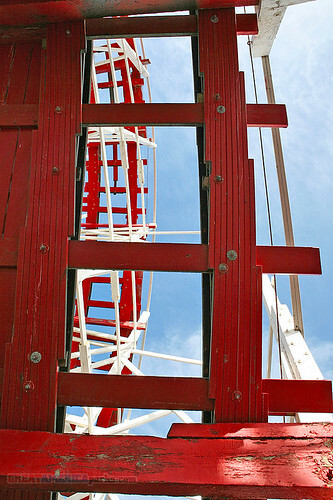 “They couldn’t get out because the brake release is outside of the car!” She fondly remembers rides on the Giant Dipper — dashing into the initial tunnel and then creeping up the lift hill in it and feeling giddy anticipation of the first drop. The Giant Dipper car is here! ACE members will get their first opportunity to experience Roller Coaster Rampage at the annual Yuletide Party at Playland-Not-at-the-Beach held the first Saturday of December. The Giant Dipper at Santa Cruz has been in operation since 1924. ACE designated it a coaster landmark in 2007. Frank Biafore with the Giant Dipper at Playland. 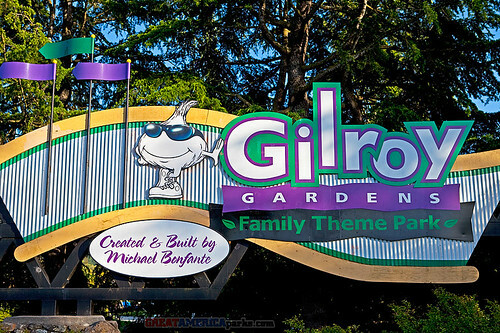 California’s Great America’s Halloween Haunt! Congratulations to the Santa Cruz Beach Boardwalk for winning the Golden Ticket Award for best seaside park for the third year in a row!!! Six Flags Discovery Kingdom has announced the Sky Screamer for the 2011 season! Click on the image above for more details.